My Birthday (yesterday) was WONDERFUL!!! Thank you for all the birthday e-mails everyone!! and continues until next Sunday! It's a family tradition in our family...whoever is having a birthday gets a big dinner, cake and presents and the best of all we all get together for laughs and a good time! It is a tradition I hope we always continue!! Then Sunday I have appointments with several clients and will start the packing organization....because...Thursday we leave for the "Arnold". Just two days after my b-day:) Thanks to my long-time client John for sponsoring this trip and being ok with little Logan coming along. It should be a great time! You won't be able to miss me with Logan on my back:) I am looking forward to seeing so many fellow competitors, seeing the competitions and the other events as well. Also having the time away with my husband. We don't get away very often! My birthday (Tuesday the 26th) I plan to go for my yearly special treat...a massage! Every year on my birthday I go for a massage..it is the most amazing way to start out a birthday. I recommend it for everyone! Then my husband takes me and the kids out for a special dinner;)...Baby Logan will be 8 months on my b-day..wow can you believe it! He's so heavy to carry around;) my arm goes numb and I have to switch often..he's a big guy, making sure I don't slack in the 'gun' department I suppose! Make a birthday wish for me! two of my clients competing this spring. press, push, pull, curl, extend? Week after week, month after month, year after year? Even after the stage comes down, the camera's disappear and it's just you and the weight..
How hard will you drive? How much time, focus and will? How far will it push you to the edge? Can you see what you want despite all the road blocks before you? Bodybuilding is NOT just about the final external product, it's about training your mind to do things your body never imagined possible and making them possible! Which in turn..affect all areas of your life and the way you approach every challenge. I hope you all had a memorable Valentine's Day with that "someone special". With 3 children Valentine's Day is usually shared with all the kids! I am a room mom as most of you know for Alyssa's class every year so I was the "craft mom" for the afternoon and then my valentine (my husband Michael) and I were able to go to dinner with the boys while Alyssa was at gymnastics. Wade and Logan are so good, makes going out a very pleasant experience! and for our 3 little blessings that keep me so busy and happy! "Everybody wants to know what I am on. I'm on my bike... six hours a day. but first you have to believe." 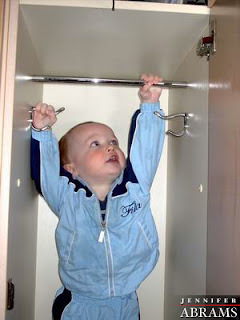 in the gym locker room when he was 15 months old. Alyssa after her gymnastics meet last weekend!